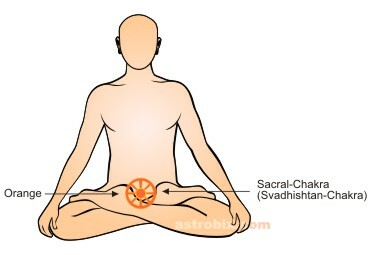 Orange color is related to the Sacral Center. This Chakra is located in the lower portion of stomach in a human body. This Chakra is linked to the following organs:- uterus, large bowel, prostate, ovaries and testes. The endocrine gland related to this Chakra is ovaries and testes. When orange color or Sacral Center is in equilibrium in human body, then the person is glad with everything. He does not lack self confidence. He is full of excitement and exultation. The individual does not like to depend on others and is self-supporting. His thoughts have creativity. Takes interest in imaginative works. If the Orange color or Sacral Center becomes weak in a person, he start depending on others. Can be proud and likes to showoff. May have to spend his life with others’ support. The person’s behaviour might be destructive. The individual may be reclusive. He does not like meeting others. He may have difficulty in communicating with others, that is, he can not interact properly. Problems related to orange color:- problems related with menstrual flow, pre-menstrual syndrome, Prostatic disease, testicular disease, irritable bowel syndrome, ovarian cysts, Endometriosis. Orange color is the least liked color among all the colors. That is why, more problems are found related to orange color or Sacral Center. But, orange color is very good. This color grows self confidence in an individual. Gives in excitement and energy and builds passion. The color is excellent for creative works. Using this color inside the house, keep the environment well balanced. This color gives an individual, enjoyment in every task and makes him social and communicative. Orange color can be used at places where creative works are done and, high rate of actions and activities are performed. Orange color is not suitable for the bedroom. Also, stress prone people should not be over-exposed to orange color. Include a orange colored clothing item or accessory in your attire regularly. Keep a orange colored piece of crystal or glass in your workplace, or in your home. Use a orange colored night-dress so that you may benefit from the energies while you sleep. Use orange colored bulb or night-lamp. If you don’t find a orange colored bulb, you can use a orange colored film to wrap around a regular white bulb. Include orange color in your home furnishing. Visualize the orange color in your head during the day.